Thanks for setting us straight! I’ve corrected the post. 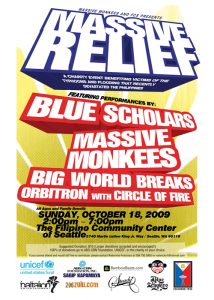 I got that info from the P-I article that says “Sunday’s show will mark the first time Massive Monkees and The Blue Scholars, two of the most famous Seattle acts, share a stage.” Oh, well. Thanks for the correction! What’s the link, Wendi? We need to link to it if we used it for source material. We did. Click on “benefit show” above.